Ironman Canada is no more. Well, sort of. The long standing race parted company with the Ironman brand towards the end of last year and became part of the Challenge Family. Instead there is Challenge Penticton, taking place for the first time this weekend. A new name on the same course which means I can use the last 8 years of Ironman results to offer some insight into the weekend’s race. To confuse matters though there is a new Ironman Canada taking place in Whistler on the same weekend (and only a week after another Canadian Ironman took place at Mont-Tremblant). The same name, but a different course so these results will offer little insight for the new race. Ironman Canada was not a fast race. 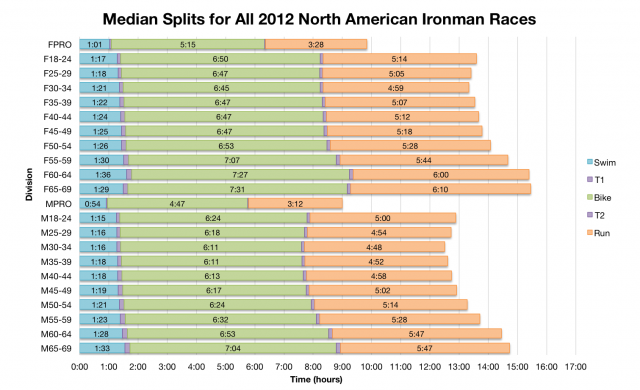 As the two charts above show it took on a typical distribution of splits for a North American Ironman. Neither course, conditions or the depth of field varying so drastically as to produce significantly different results. Other races like Ironman Florida and Ironman St. George sat more at the extremes offering fast and slow times respectively, but Canada sits in the middle of the pack. 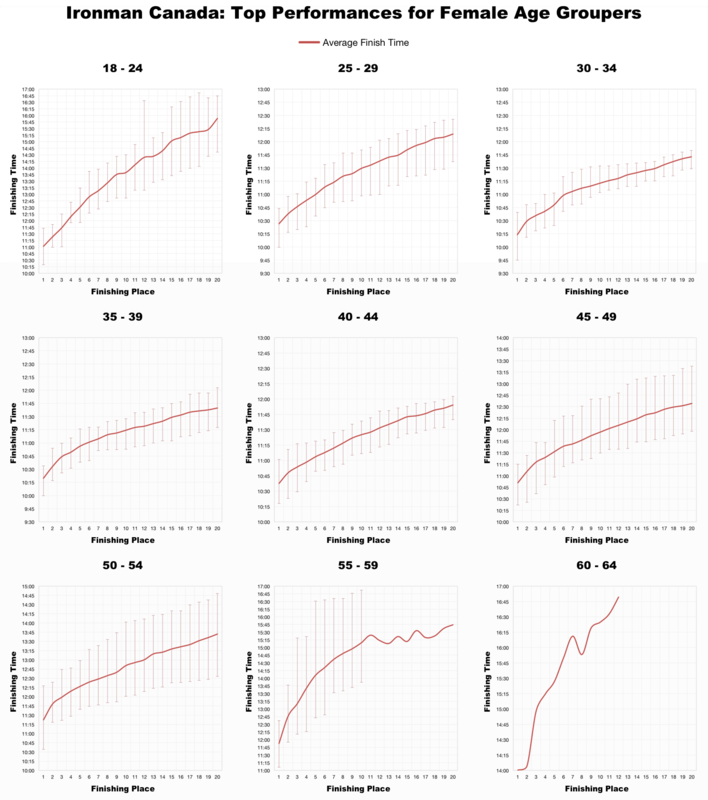 The median splits across age groups present a slightly different picture when compared. Averages from Ironman Canada are generally a touch faster on both swim and bike among the age groupers. It is worth noting that the opposite is true when comparing the professional field. 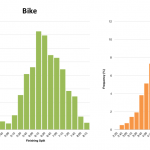 The time differences are mostly small and don’t represent a significant difference in performance. 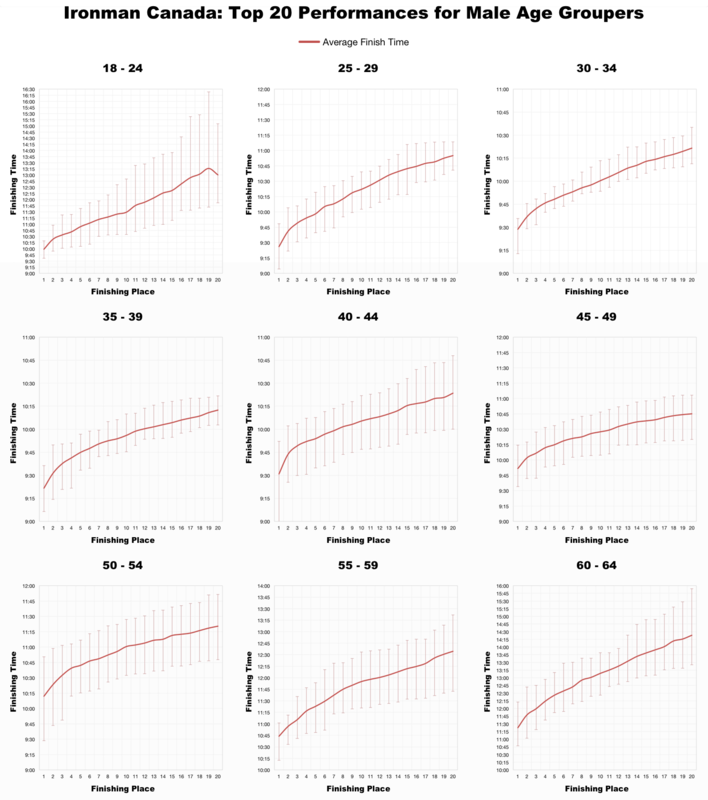 Perhaps Canada was a fractionally faster age group race than the North American average, but it’s hard to read too much into such high level numbers. There are no Kona slots in Penticton now. 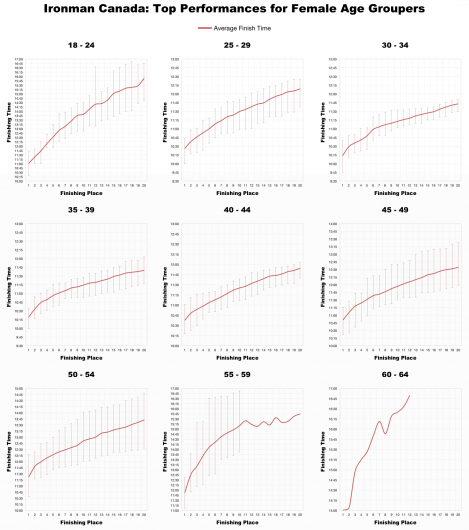 However it’s still useful to look at the times from the top age group performances. As a group the trends can often differ from the broader field of athletes and even in tougher years fast times may be recorded. Looking at the men’s field, the range of top times are broadly comparable with those seen at Ironman Mont-Tremblant last weekend. 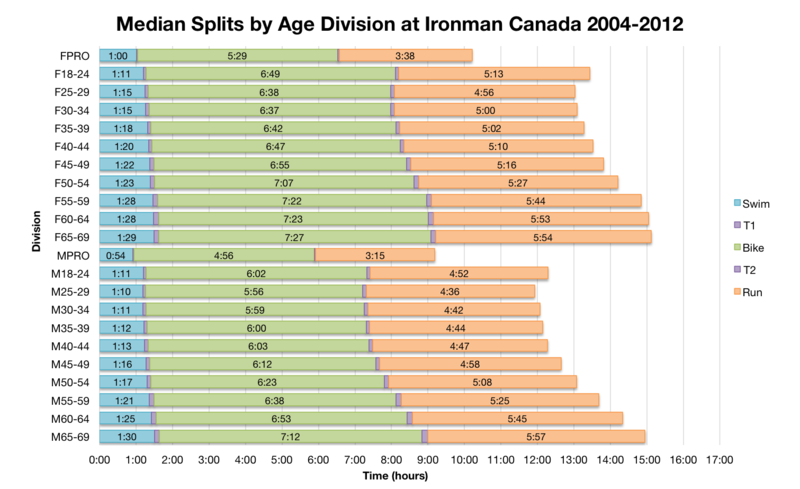 The two course may be different, but fundamentally the times of lead age group athletes at Ironman Canada are not dissimilar to other races in the region. There are changes that come with a Challenge event that may impact the results. By default Challenge race starts are performed in waves each separated by 5 minutes, this can help reduce course congestion, but it’s hard to assess the impact on times. Course congestion may not be an issue though: while Ironman Canada saw start numbers in excess of 2,500, Challenge Penticton appears to have just over 700 athletes registered to start with 200 teams racing alongside them. 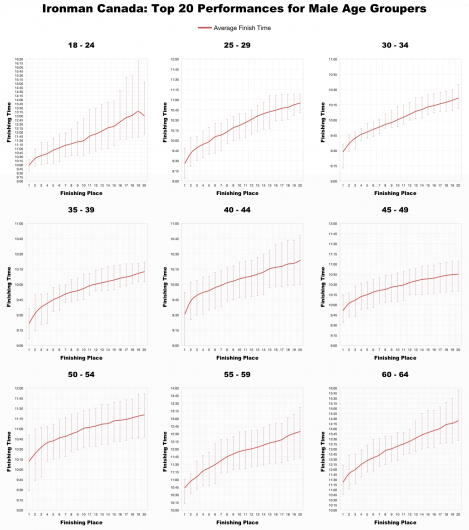 At under half the size this is likely to impact the overall spread of results. For contrast the new Ironman Canada in Whistler has around 2,600 age group athletes registered for the first edition of the event. Perhaps it’s interest in a new course? All the Canadian Ironman courses are appealing. Equally likely though is the impact of the Ironman brand name and the generous allocation of 100 Kona slots to the new race. Accessibility of results allowing I will analyse the results from Challenge Penticton along with those from the new Ironman Canada. It will be interesting to see what if any impact the new brand has on the old race, I suspect the smaller field size will cause the biggest differences. It will also be interesting to see how the new Ironman Canada stands up, such a large number of slots may have drawn a competitive age group field.